Bev learns what Sorghum is, Sam realizes her goat breeding schedule is a wee bit inconvenient, and they chat about planting a pumpkin patch, brooding baby ducks, and the sad mistake Bev’s family made. The drinks for this episode were sponsored by @homemade_confetti, cheers lady! Take our survey! This helps our podcast keep going and it’s totally anonymous! Sam & Bev have more info on medicated chick feed, Bev is future garden dreaming, Sam is eating consciously, and they can't believe there's a codfather. This Episode is brought to you by our Executive Producer Patreon Contributors! Thank you Ashley Kirnan, Montanna Combs, Christine Cianni, Natalie Quist, and Jessica Hawkins! Bev & Sam are so EGGcited to share this chat with Homestead Jenn & Homestead Phil about their fun chicken venture - Rent The Chicken. Why would anyone rent a chicken you ask? Listen and find out! The answers may surprise you. They also share about their Amish made coops and chicken toys, how to save your school's elementary teachers from having to find homes for baby chicks every year when they hatch as part of the curriculum, and a fun business opportunity for fellow homesteaders. This Episode is brought to you by our Executive Producer Patreon Contributors! Thank you Ashley Kirnan, Montanna Combs, Christine Cianni, Natalie Quist, and Jessica Hawkins! You guys make these extra episodes possible. We're high-fiving you big time! Shop for Amish made coops or use code DRINKANDFARM to save 15% off of playsets from The Chicken Network! Sam & Bev tried to keep the BS down, shared how to give goats & chickens penicillin when needed, using Ivermectin to deworm goats, discover what medicated chick feed is NOT, dispel some pig myths, freak out about the garlic episode of Rotten, and discuss a fun local food challenge. Wondering where the BS is? It's up on Patreon! You don't have to be a current Patreon member to listen, so check it out! Please take our listener survey. It helps the podcast! Join the Facebook group and keep the Drink & Farm fun coming! Check out the Local Thirty Challenge! Bev & Sam BS a lot, gush about how creative all you listeners are, chat about seizing the days that you can perform farm chores, feeling inadequate when scrolling through social media and just celebrating how you decide to farm, their humanness, recognizing and treating spraddle leg, egg yolk peritonitis in chickens, tetanus antitoxin for goats, and making the tough decision to cull an animal. @WildOaksFarms - Go follow her, she's AWESOME! 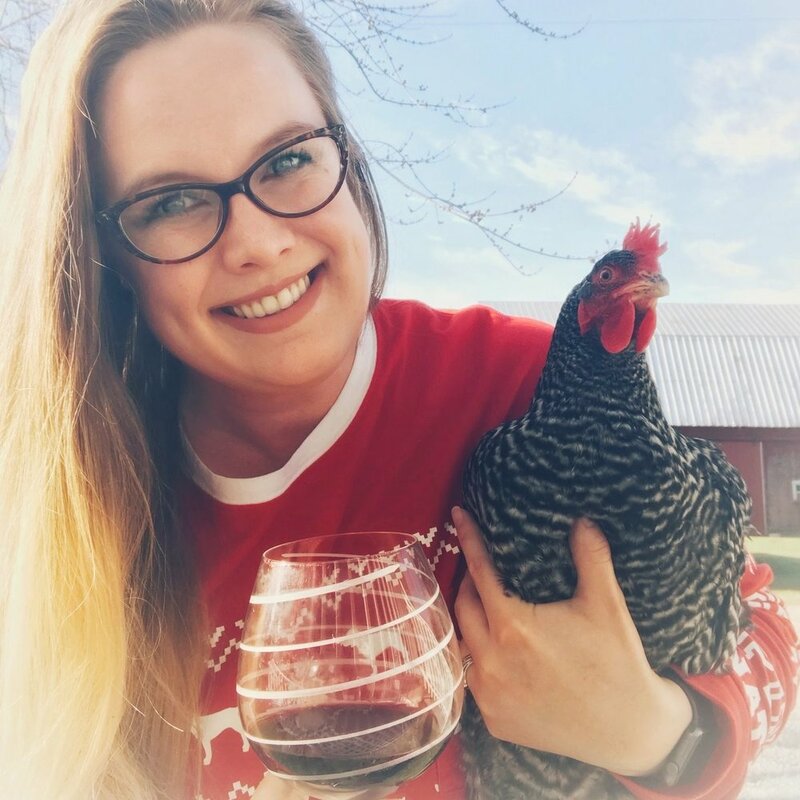 Sam & Bev chat with Shannon from @Country_Fried_Tina on Instagram about how she discovered Marek's disease in her chicken flock, and how she's managing it. This episode is lovingly dedicated in Tina's memory. You can learn a lot from a little chicken. Thank you Patreon Contributors for helping us make these minisodes better! 10 drops colloidal silver into their water twice monthly . Added oregano, herbs (herbin' backyards herbs worked great for me) into her food. HYDRATION is so important! I always watered down her food because she had hard time getting to her water bowl. Colloidal silver 10ppm ten drops in her food. Hypericum 30x two tablets dissolved into a shot glass of distilled water. I'd give 6 drops into food. Alternate colloidal silver and hypericum (st johns wart) every 4 hours. Can also give on bread! **Again I am no doctor and went off of recommendations and some research and I really feel it's the reason she stayed with me so long. Good luck to anyone dealing with this disease. Sam & Bev discuss their lives outside of farming, how they are dealing with just having too much to do, getting help with the non-farming things, and who is capable of farming (spoiler alert - anyone who wants to!). This Episode is brought to you by our Patreon Contributors! You guys are the one's who make this podcast happen! The website from Bev's beer. It's pretty great! Bev & Sam have a fun, sassy chat with Kathee from Messy Mildred ALL about chicken shampoo! They also discuss being a badass, putting yourself out there, warding off the haters, and how chickens suffer from the ultra-common disorder RBF (resting beak face). This Episode is brought to you by our Patreon Contributors! You guys make these extra episodes possible. We're high-fiving you big time! Sam & Bev are STILL talking about Marek's, discuss what "Give Zero Clucks" means to them, correct themselves about a few things, Sam has MORE bunnies and shares how to manage one mama with two different aged litters, eating rabbits and squirrels, brooding chicks under different color bulbs, how important self care really is when you farm things, and how you should wait to judge the tools real farmers use or risk looking silly on the internet. The drinks for this episode were sponsored by @thimbleworks Cheers lady! Check out Thimblework's shop, and get your own awesome beer or wine tank. Bev & Sam had a super fun live happy hour and go into more detail about a question they received during it about vaccinating for Marek's, how the vaccine works, giving vaccines to day old chicks, and bust a myth about organic standards. Bev shares the total cost of her first round of meat chickens, and Sam reads a great listener farm story! This Episode is brought to you by our Patreon Contributors! You guys make the magic happen! Watch the LIVE Happy Hour in our FB Group! Sam & Bev meet for the first time EVER and talk all about it and the alefest, follow up on goat de-worming practices and keeping chickens cool in the summer, Sam gets her final flock diagnosis and they chat about how sometimes bad things happen despite good flock management, and Bev tells all about her back & hip issue and how cool it was to watch the turkeys hatch. This Episode is brought to you by our Patreon Contributors! You guys totally make this podcast happen! FAMACHA - Thank you Erin!! Bev & Sam get to know the crew at Grubbly Farms! Learn how the company behind #grubblieshappyhour got started, what the black soldier fly larvae were originally intended for, how they are making a HUGE environmental impact, and enjoy some laughs as they share several hilarious larvae stories. Sam & Bev talk merch, keeping your animals cool in this HOT weather (whoohoo Grubblito! ), sick goats, probiotics, how to NOT feed goats, leukosis and Mareks in chickens, taking the shame out of finding out your flock has a serious illness, and shedding guilt over medicating animals when they are sick. Get a shirt while you can! Thanks @diyfarmlife for the digestion recipe for ruminants!! Bev & Sam discuss what their podcast is really about, making Instagram a friendlier place, ulcerative enteritis in chickens, an update on the turkey eggs, why Bev will never open open a dud hatching egg again, not believing your kids when they say an egg seems extra gross, Bev treats her first goat illness, and they answer some fun listener questions. This Episode is brought to you by our Patreon Contributors! Don't forget to join in at the swag level in June to get a surprise in July! Order shirts through July 10th or so? We can't find the closing date.